My home is full of vintage bits-and-bobs, from old pieces of furniture and crockery, to handprinted throws. With Instagram and Pinterest at our fingertips, it’s easier than ever to draw inspiration from craftsmen, illustrators and artists who create unique handmade items. That’s how I discovered Teresa Dunne of Willapark Designs. Teresa, who lives on the rugged and beautiful cliffs of north Cornwall, works from her studio making embroidered, mixed media pieces. She shares her creations on Instagram via @willaparkdesigns, but I caught up with Teresa to find out a little more about her work. 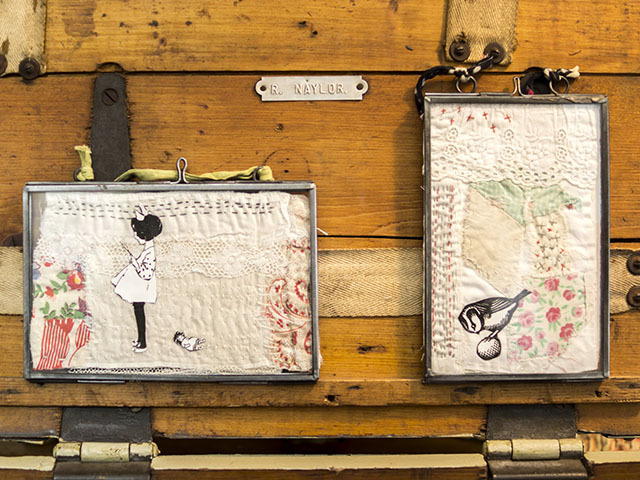 What inspired you to become a textile artist? After visiting a local vintage fair, I decided I wanted to become part of this lovely collection of sellers and artisan makers who all share a love for the old and forgotten objects from our past. Textiles that were brimming with history and stories to tell, fabrics that still showed the marks of a former seamstress or maker where the thread had been pulled through, suddenly became an obsession for me and I just had to stitch! I think my skills as a textile artist come from my Grandmother who died when I was 10 years old. Nanny was a seamstress on Bond Street in London and I remember her making clothes for me and putting the ethos of ‘make do and mend’ into practice. 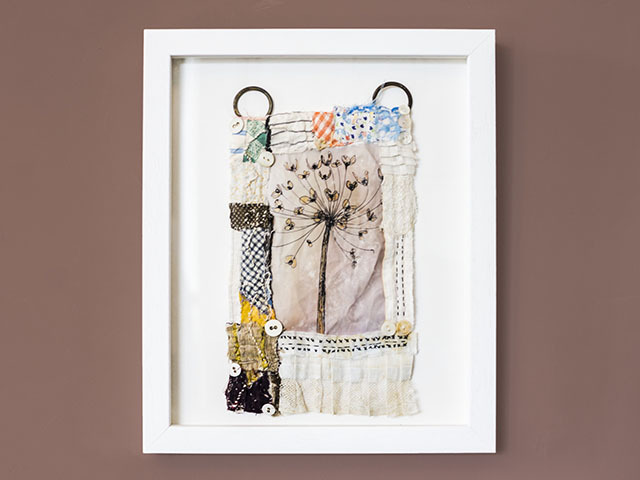 I make mixed media collage textile pieces using scraps of vintage and found materials. I join them together with distinctive, naive hand stitches, which become part of the narrative running through the finished piece. Each piece of work is unique. 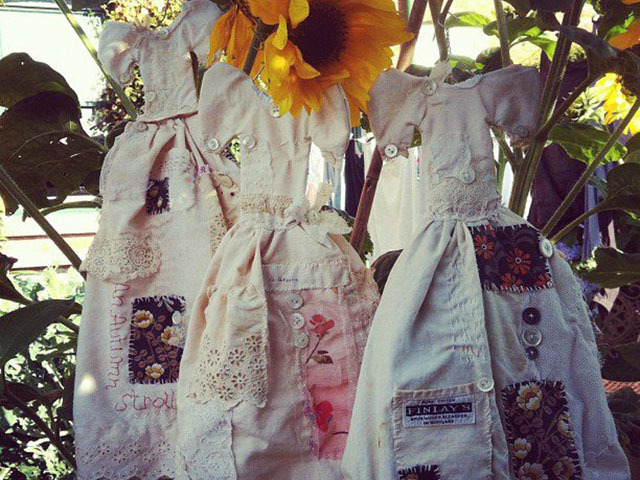 I tend to use French linen, vintage lace and gorgeous quilt pieces that are quite worn with rips and tears. I love finding rusty stains on the fabric with laundry labels and names. 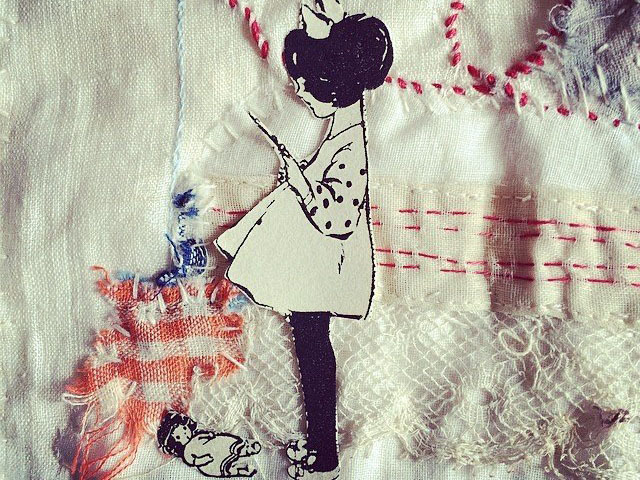 I love working with Victorian flounces, scraps of vintage fabric with the marks of thread or pin holes. My inspiration comes from different areas. It could be from a piece of art I have seen in a gallery, a book, words and narrative, or a piece of vintage material. I find my stitching just develops as I sew. I usually have a rough idea of what I’m going to make but I never really know what it’s going to look like until it’s finished. Your miniature dresses are strikingly unique. How did you come up with this concept? My inspiration for my dresses came from the theme ‘make do and mend’, which I was researching at college. I looked at garments and how they were constructed and decided to experiment with making them. I always make the skirt first, placing the scraps of fabric and lace as I go. I then hand stitch it into place with simple stitches, layering more fabric and adding buttons. I usually like to add some hand stitched words to give the garment character and individuality. The bodice is made to fit the skirt. The same process is used but I keep it very simple with a collar, puff sleeves and a few embellished stitches with buttons. I then attach it to the skirt and use wire to make the bespoke coat hanger for the final touch. I make all my own labels using the pages of old books and coffee to stain. This really adds to the ‘old’ look. Using a 1950’s typewriter, I type the description and prices, threading the label with muslin to attach to the coat hanger. It’s all these little touches that are sometimes the most important. I knew that if I wanted to evolve as a creative person I would have to learn new skills to develop my work. So, I went back to college to study an A-level in textiles for two years where I gained two A grades. I am currently studying Art and Design foundation at Truro’s Tregye campus, which I’m doing over two years. The course is giving me the confidence to experiment with various processes. I am constantly learning new techniques, and this is showing in my professional work. Going back to college as a mature student was one of the best things I have ever done. 2015 is going to be a very busy year for me. I exhibited at The Contemporary Textiles Fair in Teddington at the beginning of March and will be at Selvedge Spring Fair at the American Textiles Museum, Bath, at the end of March. In April, I’ll be exhibiting in Chelsea, and in June, I will be at The Contemporary Craft Festival, Bovey Tracey. To find out more visit www.willaparkdesigns.com. Teresa’s work can also be found at madebyhandonline. Follow her on Twitter and Facebook.